Available in 0-3 Months, 3-6 Months & 6-12 Months. 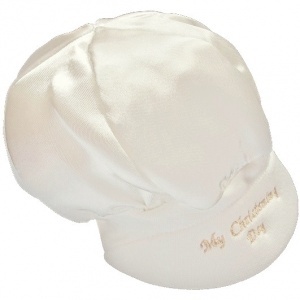 Beautiful baby boys ivory satin my christening day hat, perfect for your little boys christening day. This beautiful ivory hat is of a cap style. It is made of a soft satin and is fully lined. It has 'My Christening Day' beautifully embroidered onto the cotton peak in gold. It has an elasticated cotton trim for a secure fit. This will beautifully compliment your baby boys christening outfit / suit. These hats are stretchable so the hat circumference measurement is "un-stretched - maximum stretch".